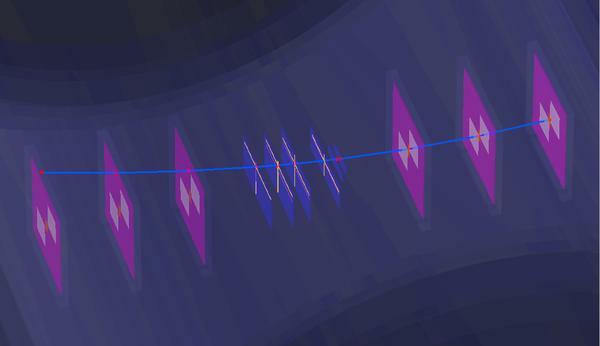 Reconstructed track of a particle through the layers of the vertex detector (middle), also traced by the EUDET telescope (left and right) at the DESY testbeam. The Belle II experiment at the SuperKEKB accelerator in Japan, which will start operating in 2016, aims to solve one of the great mysteries of particle physics; that is, why the universe today is filled almost only with matter,although in the big bang, matter and antimatter should have been created in equal amounts. Physicists attribute the different behaviour of matter and antimatter to the violation of the so-called CP symmetry, which states that the laws of physics should not change in a system, if all particles are interchanged with their antiparticles and the signs of all spatial coordinates are flipped at the same time.Scientists have already identified processes that break this CP symmetry. However, the extent of the observed CP violation is by far not sufficient to explain the actual excess of matter in the universe. To test the theories of these physics, the scientists will measure the difference in behaviour of matter and antimatter extremely accurately. To this end, the Japanese accelerator laboratory KEK is upgrading its KEKB ring accelerator to a “super B factory”, an electron-positron collider that produces an enormous amount of particles called B mesons – more than 1000 pairs of them per second. Their decays will be measured with high precision using the Belle II detector and they are perfectly suited to search for hints of new physics. One of the central components of this versatile detection device is the vertex detector, which records particle decays right at the collision point. The detector consists of several silicon layers. The two inner layers, which are extremely thin, are read out pixel by pixel, the four outer layers strip by strip. For the first time, the novel DEPFET technology that was originally developed for the future ILC will be used for the pixel detector. With its thin layers, this technology is extremely suitable for low-energy particles. 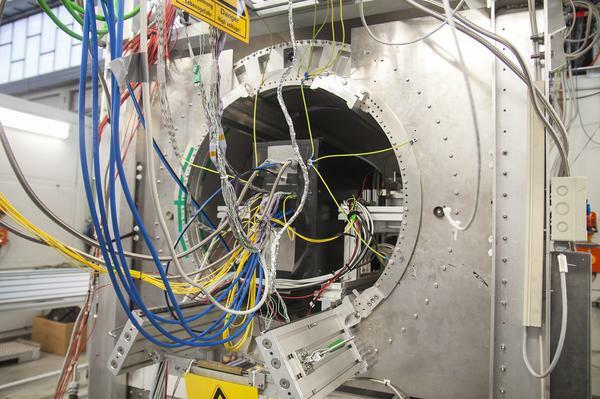 The detector will be built by DESY, together with seven German universities and the Max Planck Institute for Physics in Munich, and the Semiconductor Laboratory in Munich which developed this technology. In their measurements at the DESY test beam, the scientists for the first time tested the interplay of pixel and stripe layers and the corresponding infrastructure in a setup close to reality. They built the detector components into a superconducting magnet and submitted them to a massed volley of fire of precisely localized electrons from the DESY synchrotron. In doing so, they managed to carry out first tests of the so-called trigger which is used to select the collisions to be tracked. The high collision rate in Belle II will generate amounts of data of about 20 gigabytes per second only in the small pixel detector; far too much to read them out unfiltered. “This is why the high-level trigger is to define regions of interest quickly and reliably in the pixel detector, and we will then record only these data,” said Carsten Niebuhr. The complex experiments at the test beam needed extensive preparations. Already end of October, more than 80 experts met at a workshop at DESY to prepare the measuring campaign. The now obtained know-how will be incorporated in the final vertex detector. Another system test with the final sensors is planned at DESY for the end of the year, before shipping the completed pixel vertex detector to KEK for assembly with the strip detector and for commissioning. The installation into the Belle II experiment and the beginning of data taking is envisioned for 2016. The setup was mounted in the superconducting PCMAG magnet which provides a one tesla magnetic field.